December 28 is National Card Playing Day. Cards can be used to unite friends, amaze strangers, and even master math facts. Playing cards have a rich history. Due to the fragile nature of the card, there is no definitive history of playing cards. They are believed to have originated in 9th century Tang China, then spread to India, Persia, Egypt, and arrived in Europe through trade with Egypt in the 14th century. The suits we know - diamonds, hearts, clubs, and spades - are about 700 years old. There are correlations between playing cards and the natural world. There are 52 cards in a deck and 52 weeks in a year. There are four suits in the deck and four seasons in the year. Each suit contains 13 cards, and there are 13 annual cycles of the moon. Playing cards deliver pleasant visual and tactile experience. Sized just right for even small hands, cards are made with thick, coated papers and decorated with engaging graphics. Anyone can afford cards. You can procure a two-pack at your local dollar store for - surprise! - a dollar. Spend a little more, and possibilities abound. About $200 scores elite carbon fiber playing cards. Gold leaf is another option. Themed decks are popular. In the STEM vein, there is a deck in which the suits are mathematicians, inventors, astronomers, physicists; the Ace is appropriately Albert Einstein. Today there are thousands of card games. Some are games of skill, others games of chance. Many card games sharpen the players' basic math skills, as well as critical thinking and strategic planning. Some of the top card games are Solitaire, Spades, Poker, Hearts, Rummy, Black Jack, and you can't forget the foundational Go Fish or erudite bridge. 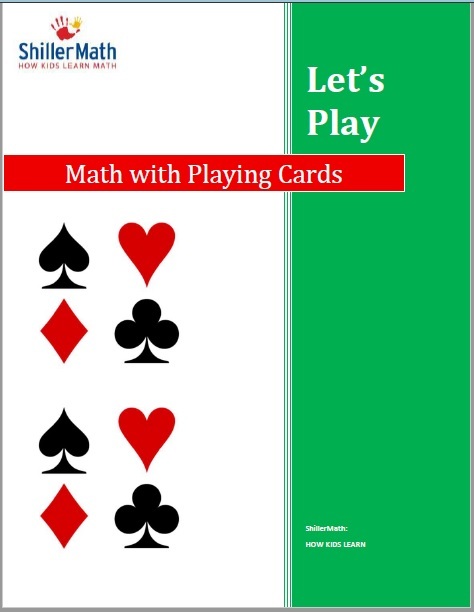 To celebrate National Card Playing Day, ShillerMath created a free, scripted, activity eBook, "Let's Play: Math with Playing Cards." The ShillerMath Montessori math curriculum uses playing cards in Kit II (4th through pre-algebra) to explore math concepts such as charts and graphs, mean, average, probability, and variables. Ideal for a younger audience, this eBook is the perfect complement to ShillerMath Kit I (pre-k through 3rd grade) or any homeschool math program. Introduce playing cards using the Montessori three period lesson; reinforce math vocabulary such as quotient, product, difference, and sum; and practice math facts with card games. Put away the worksheets and start shuffling! Download your free Let's Play: Math with Playing Cards eBook and let the games begin.